To reduce your cost, Brandsport offers this item in Bulk (sold here individually). Gorilla also lists this same item in a 24-piece # 21134BC kit. Black Small Diameter Tuner lug nuts from Gorilla are the perfect replacement upgrade. 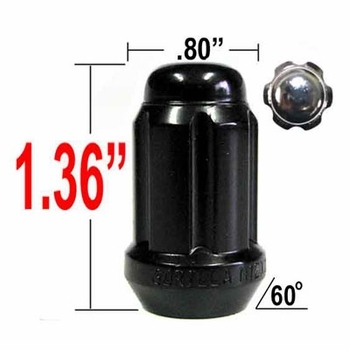 You can match your factory lug nuts with a quality replacement of Gorilla Black Small Diameter Tuner lug nuts. Quick installation and removal is a given with a new set of Gorilla Black Small Diameter Tuner lug nuts. Enjoy the lasting beauty with a set of Gorilla Black Small Diameter Tuner lug nuts. Found my lug nut with ease and ordered it with out any issues.